Future of US China relationship. Comprehensive Measures of Intl Power vs Nations GDP. Ambassador Roy also presented at the Shanghai Institute of Intl Studies before the AmCham Shanghai](http://www.amcham-shanghai.org/) presentation. US may be distracted by domestic difficulties. As China becomes more influential, why would China defer to the US? Problem: – There will be a period where China is economically dominant, but the US is militarily dominant. – The problem is the period of time from the beginning to the end of this transition. There is zero Int’l support for “containment” of China. Nobody is willing to go against China. There is no inherent reason for conflict with China. “China Telecom” high-speed Internet service in Shanghai is actually quite good, much better than anything else I’ve used in Mainland China during six years of extensive travel here, but I noticed ads started popping up on pages that I’m certain never had ads before. Moreover, the ads all look the same. I did a bit of searching, and some Chinese users have came to the same (irritated) conclusion as I, that China Telecom (中国电信) is actually inserting these ads into 3rd party web pages, without any regard for the original content of the page. Fortunately, it seems that “ct10000.com” is on the FireFox AdBlock Plus black list, so I’ve installed the FireFox AdBlock Plus plugin to prevent these China Telecom ads from popping up. I spent quite a bit of time writing about the Chinese Real-Estate bubble in 2009-2010. Back in 2005, the bubble (based on affordability ratios) was already evident, but post Gov’t stimulus boondoggle, the bubble turned into a super-bubble. Sometime in late 2010, I had written everything that I really had to say about it, and since there’s no equivalent of Chinese-CDS that I could find to buy and make some cash on the impending real-estate meltdown, I could only sit back, think about other things, and wait for the inevitable. 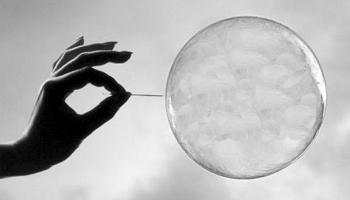 Jan 2010 – China Bubble? Jim Rogers “No”. Jim Chanos “Yes”. Most interesting notes from two years ago? This is exactly what China needs to worry about – when the debt is unwound, what will keep the brakes on the descent. The 2009 “Expand Domestic Consumption” (扩大内需) policy of China has been a newspaper success around the world, however, I’m inclined to think the result will be exactly what was experienced in Japan: “succeeded only in inflating the national debt”. So here we are. The music has stopped. Let’s see who sits down, and who doesn’t. In the long run, this is a very good thing for the Chinese economy. Every day earlier means less mis-allocated resources to re-allocate. Could the technocrats have planned this all along, as a way to force wealthy Chinese to provide financing to develop new housing for the rest of the nations citizens, and crash the market enabling those less affluent citizens to buy up the houses at effectively subsidized prices? Before you start looking for an apartment anywhere, the first step it to set your budget. 2 because the unit was purchased after 2008, you can probably find a 2005 unit of identical location and near identical quality for about half the price, as the land lord would have only paid 25,000 RMB/m². Obviously there is a status benefit, particularly important in China, associated with the higher rent location – but if you’re simply looking for a great location and a great value, you’re best of looking for someplace built between 2000-2005. Next, DO NOT GIVE UP, DO NOT GET DISCOURAGED. Each time I’ve found an apartment that I really liked, I searched for two weeks, looking at 50 different apartment units, before finally settling on one that I like. No single agent will take you to so many places, but there’s an easy work around. First, decide approximately which neighborhoods you would consider living in, probably something in proximity to your work, your social circle, or your preferred transit option, and then walk around on the neighboring streets looking for real estate agents. Agencies are local, and even though they can access their shared database throughout the city, they’ll often have the key to the units you want to see at an office near by. These are the obvious things – what about not so obvious things. Shanghai is extremely cold in the winter. If you haven’t lived here yet for an entire winter, you really have no idea how cold it gets. Most importantly, when you’re outside with heavy clothes the Shanghai winter is OK, but when you come home, stop moving and remove your down jacket, you’re in for a horrible surprise. Shanghai has high humidity, between the low temperature and the wind, it’s possible that you’ll never feel warm at home. First thing, make sure that you’re apartment has THERMAL PANE (double pane) windows. I’ve found some amazing apartments with beautiful views, but rooms full of big, sliding, single pane windows provide approximately zero insulation value. My advise, forgo the most breathtaking, all glass walls, in favor of more moderate window placement. If you can find a place with either heated floors (地暖) or boilers/radiators (暖气), then you’ve hit the jackpot. These systems burn natural gas (煤气) so while they provide heat that doesn’t dry the air, they also will save you thousands of RMB/month if you leave the heat on. Depending on your personal situation, you may or may not need a tax receipt. If you do not need one, expect to save about 5%, or conversely, if you do need one, expect to add 5%. For rental properties, there is no “standard” of whether or not a tax receipt is or is not included in the asking price. You need to inquire. Under normal market terms, the association fee (物业费) is to be paid by the landlord, not by the tenant. If the land lord wants to fight about who is responsible for the association fee (物业) then you’ve probably found a real cheapskate and will probably run into other problems down the road. Normally you will only be responsible for: Water, Electricity, Gas and Internet (水电煤及宽带). Throughout Shanghai, a large percentage of the landlords are from Wenzhou. Almost all are absentee landlords and they generally take zero pride in maintaining a quality apartment, or providing a fair value. They are generally real estate speculators, and are generally horrible land lords. If anything breaks, do not expect your Wenzhou land lord to do a respectable job making repair. On the other hand, land lords that have an overseas connection are generally fair and win-win oriented. The stronger that overseas connection, the better I’ve found it is to work with them. Bottom line, if the land lord is from Wenzhou, a big minus. If they went to school overseas, a big plus. 5. WHY NOT THREE YEAR? Whenever possible, I would recommend signing a three year contract. Inflation in China, particularly in Shanghai is out of control. Signing up for a longer contract is beneficial for the land lord, they know that the apartment is not at risk of sitting empty, but more importantly, it protects the tenant against annual rent increases. Use a longer term as negotiating leverage to get the lowest possible price, and lock in that price for as long a period as reasonable. Moreover, if you know you’ll be in a unit for three years, it’s reasonable to make some improvements to the unit, without being concerned that you’re simply giving your land lord leverage to raise the rent a few months later. For example, if you sign three years, and spend 20,000 RMB on repairs, that only works out equivalent to the land lord raising rent by 555 RMB/month. You’ll also save paying out the AGENT FEE if you decide to move. I’ve even heard of cases where the tenant is to pay 2-months fee to the agency, but I would suggest you walk away immediately if your agent tries something like that. The best case scenario is that the landlord + tenant combined pay 1-month of rent to the agency. As the tenant, the lower you can negotiate the fee, obviously the better. Depending on your style, you may or may not want to negotiate it up front. If the agent that showed you a unit that you happen to really like seems to not be operating in your interest, and tries to charge you more than 50%-month worth of rent, then you may consider telling one of the other agents that you’ve been working with about the community/building/unit number, and they can look it up and broker it for you. This is a bit devious, so you should only resort to this sort of thing if your agent is simply doing the minimum amount of work possible and not working in your best interest. It’s also important to understand exactly what the agency is responsible for delivering. There are a lot of lazy agents that simply pick a few nearby units that seem to be at the top of your price range (therefore maximizing their commission), take you for a quick look, and pressure you to sign the contract. There are also excellent agents that will spend hours going through the listings databases plus their own network of contacts to find a unit that really matches what you’re looking for. Some agents provide amazing after sales service. If there is a problem, you call them, rather than the landlord, and they will help you to resolve it. If there is some repair or customization that you would like to do, they’ll help find people to do it. Finding a hard working, intelligent agent makes a big difference. Sometimes an apartment gets sold right out from under a rental tenant. You should ask the rental agency if this apartment has ever been listed for sale before signing a contract. If the apartment was listed for sale, then the owner isn’t committed to holding onto the property and you are at high risk of having it sold out from under you. Best of luck trying to get the “no sale” clause added to the contract. Standard is about 30 days, and as long as the apartment hasn’t previously been listed the risk is low, but at least it gives you a bargaining chip to use with the land lord. 8. INTERNET: Slow or Slower? Most apartment units in Shanghai only have 1MB or 2MB “broadband” connections, but some units quality for 10MB connections. If you use the internet extensively, it’s worth giving China Telecom (中国电信) a call at 10000 (一万) and asking which type of service is available in the unit that your considering. When handing over the keys, the land lord should give you the most current utility bills (water, electricity, and gas) and explain the current account situation. If the bills are not yet paid, then you can deduct that amount from your rent and pay it to the utility company. If the bills are over-paid, then your expected to pay the difference to the land lord. Normally all apartments in Shanghai come furnished, so the land lord will provide you with a printed sheet showing each of the items that they have provided (ie. tv, refrigerator, microwave, bed, etc), a bit like a physical inventory sheet for a warehouse. You’re responsible for making sure all of these items are retuned to the land lord when you leave, else it will be deducted from your deposit. If you want to get rid of any items in your apartment, make sure that your land lord has some location where they can be stored. Often times the land lord does not have any such location, so if you have a lot of possessions of your own to bring in, be careful to avoid apartments that are “over furnished”. Normally all apartments in China are “Pay Three, Deposit One” (付三押一) meaning that on day one, when you want to get the keys, you’ll need to bring cash for four months worth of rent, plus the fee payable to the agency. The agency fee could be as low as 25% of one month, and as high as 200% of one month. Also, the higher the monthly rent, it has a big impact on the actual amount of money that you need to turn over to get the keys. There are lots of websites that you can use to research possible apartments, but be advised that the “for rent” pages of these sites are full of bait-and-switch tactics, outright lies, and stale listings that have already been listed. Consider the risks when looking online, and once you zero in on a few areas that you like, just look for the actual real estate broker offices in that area. There are also english language oriented services, but I would avoid these unless your not concerned about paying a premium price for an agency fee. Of courses there are many many places to choose from, but these are a few of the more centrally located places that still have very good subway access to nearby communities. 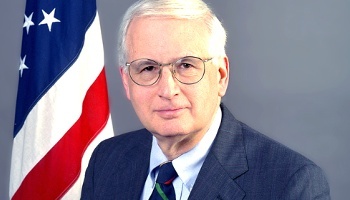 Sidney Rittenberg came to China in 1944, after 2 years studying Chinese at Stanford. He lived in China from 1944 – 1949 (5 years) and was then imprisoned for 6 years (1949 – 1955). During the Cultural Revolution, Twelve years after his release (total of 23 years in China) he managed to take control of China Radio International (CRI), and publish the following article in the People’s Daily. 11 months after this article was published, Sidney was imprisoned again, from 1968 – 1977 (9 years). After his release in 1977, Sidney continued living in China for 3 more years (Total of 36 years, 16 in prison), and in March of 1980 he returned to the United States. I’ve met few Chinese people who speak, read or write Chinese as well as Sidney – and it’s hard to imagine any other person not exposed to Chinese during their childhood attaining his level of fluency. Bottom line, even after 6 years in China, I had to check my dictionary several times on reading through Sidney’s People’s Daily article: Chinese Cultural Revolution Opens Leadership Channel for Communism. Chinese Income Gap – Problem? If you spend any amount of time in any of China’s cities, it will not take long to notice that there are MANY WEALTHY PEOPLE and MORE POOR PEOPLE. China obviously has a massive population – so you get a chance to see more people in a short period of time that almost anywhere else. Western strategists continually write about Rural vs Urban China, often writing about these in terms of Rich vs Poor China. Then they equate the current rural condition with Mao’s peasant led rebellion that founded the People’s Republic of China back in 1949. For whatever reason, pundits are always looking at the LAST PROBLEM, and when they don’t have a deep understanding of the situation, pundits like to make analogies to Chinese history. WE FOCUS ON THE WRONG GAP: China does have a rich poor gap that must be improved – but it’s not the rural/urban or even the rich/poor gap. It’s the middle class/rich gap. CHINESE HISTORY ISN’T SPECIAL: China’s history is almost meaningless in trying to understand modern China. What’s happening on the ground today in China has as little in common with the Mao era as the Civil War does with modern America. Today there was an article in StratFor (Strategic Forecasting) that focuses on the gap between China’s rich and poor. The article is titled: China Political Memo: A Growing Gap Between the People and the Elite. A recent survey conducted at several top universities in China, including Peking University (PKU) and Tsinghua University, shows that the percentage of rural students enrolled at those institutions has dramatically declined over the past two decades. At PKU the percentage dropped from more than 30 percent in the 1990s to about 10 percent today. The numbers are similar at Tsinghua and other more selective Chinese universities. The most obvious reasons for this decline include China’s rapid rate of urbanization and the increasing number of job opportunities available to the rural population. Still, the decline is a worrisome sign that opportunities for China’s rural population to attain higher social status may be narrowing. The survey findings also reinforce an already evident trend: that social mobility in China is not as fluid as the country’s economic development might suggest. Good. We’re focused on social mobility. Educational institutions are a big part of social mobility – especially access to the most elite institutions. You can read the original China Daily article: Rural Students Deserve Better. The rural Chinese population has been experiencing severe brain-drain for the last 30 years. In 1982, China was 20% urban, and only 26% urban by 1990. Today, China is over 50% urban. By 2035, it’s expected to be 70% urban. Based on the numbers given in 1990 and today – the admission numbers should probably be closer to 15%. But that’s without factoring in the “brain drain” that has already happened in the country side. The smartest, the most ambitious, the most motivated have long since left this pre-industrial farming communities, and the ones that are born onto these farms try to get out as fast as possible. So – it’s not a black and white issue – from an efficiency standpoint – to say that more farm students should be enrolled then are already being enrolled. On the other hand, unrelated changes such as improving the legal system, tax system, and real estate market would probably do more to strengthen the country. How much does the unreliable legal system do to keep people from working with those outside of their network? In any society, even an ideal one, social stratification is inevitable. But for a modern society to prosper and grow it must minimize barriers to economic advancement. Otherwise, gaps will widen among the social strata, creating potential resentment and instability at the lower levels. In China, the traditional path to a better life was the imperial examination system (ke ju), which began in the 7th century during the Sui dynasty and was open to anyone who demonstrated sufficient intelligence and drive, regardless of social status. Ke ju selected the most promising administrators for the state bureaucracy. As such, it served for centuries as a portal through which smart and hard-working youth could become part of China’s political class. This transformation could greatly change the life not only of the individual aspirant, but also his entire family. Cancellation of the imperial examination system in 1905, during the Qing dynasty, cut off this mode of access. In the 1950s, the division between the people and the ruling elite was reinforced with the introduction of the hukou system, a resident-identification program that created an official division between rural and urban dwellers. This is a typical example of bias #2 – Chinese History isn’t special. What does the “imperial examination system” have to do with modern China? The exams could be taken by male adults, and the last exam was given in 1905 – meaning that the test taker had to be born before 1890. The imperial exams were a test. “Gaokao” was a test. The SAT is also a test. Why would we assume that “Gaokao” has more connection to the imperial exams than it does to the SAT? The biggest beneficiaries of the system have been urban dwellers, who have greater access to employment, social welfare, education, medical care and housing than their rural counterparts. Despite years of campaigning by the state for hukou reform and a more equitable distribution of benefits, little has been achieved. If anything the disparity seems to be widening, which makes the findings of the recent university survey all the more troubling. Of course the industrialized (ie. urban dwellers) are the beneficiaries of modern China – because they are more productive in the urban environment. Their farming jobs are easily replaced with the capital equipment used on American farms – equipment that allows 1% of Americans to work in agriculture. One of the few portals left for upwardly mobile youth in China is the college entrance examinations (known as gao kao). The gao kao system is intensely competitive, allowing qualified applicants regardless of pedigree an opportunity to enter a university (usually in an urban area), earn a degree and find a well-paying job. While the system falls short in many ways — stipulating, for example, lower quotas for rural applicants than their urban counterparts and thereby further widening the gap — it remains the most efficient path toward the elite class, both politically and economically. And this, much like the imperial examinations once did, helps to anchor stability and, to some extent, secures the power of the elite class. While an expanding educational system was once seen as a great leveler of modern China, a growing imbalance in the distribution of resources between the country’s rising middle class and their less privileged rural counterparts is making it harder for rural youth to move upward. College tuition and fees are becoming less affordable. Many of the top universities choose students based on their acquired specialties — for example, music or technology — which wealthy students are better able to develop. This hurts rural students, who are more likely to have attained high scores through hard work. Meanwhile, many selections are based on personal networks, which further impedes poor students. The result is a narrowing of options for rural youth, the brightest of whom may not have enough money or the right connections to get into the top schools. Barriers are also being raised by the increasingly close connections between China’s political elite and business elite, both urban based. As it becomes harder for China’s rural population to break through these barriers, it could lead to growing grievances over inequality and intensifying social unrest — Beijing’s greatest fear. Therefore, Beijing may need to work to increase access, creating opportunities for the country’s massive rural population. Yes, it’s sad anytime someone is under-utilized. In 1982, 75% of Mainland Chinese were subsistence farmers. Today it’s less than 50%. Seems reasonable to believe that the 50% that are still subsistence farmers are probably not much better off than they were in 1982 – because they are no more productive than they were in 1982. However, if they want, then can go get a job in an urban area. They can work in the factory, and their kids can get a shot at really integrating into that urban area. Unless the government makes a mess of inflation – there was 100% inflation leading up to the 1989/6/4 incident – the farmers will be fine. They know their future awaits them in the city when their time comes. If not them personally, their children or grandchildren. The bigger problem is that the wealthy/elite are very entrenched, and getting more entrenched by the second. The far more interesting survey for Tsinghua and PKU would be: what is your parents net worth? or what bureaucracy do your parents run?Knowing how relationships and favors work throughout China, I would be very pleasantly surprised if these numbers were anything like a representative (meritocratic) representation of urban China. The Chinese Middle class has average incomes around $10,000 USD/year. Meanwhile, China has more than 1.11 MILLION households with net worth over $1,000,000 USD. Houses in most urban areas of China can not be purchased by the “middle class” with the current middle class income:home price ratio. It’s not the barrier between the poor and the middle class that China needs to worry about – this is a barrier that the motivated can easily overcome. It’s the barrier between middle class and wealthy that they need to worry about — because the smart, ambitious, but frustrated — those are the ones you’ve got to worry about. About Us: The “ECO” Chinese language website was established in 2006, it is <The Economist> magazine’s hobbyists homeland, made up through the power of Chinese people all over the world translating every issue of The Economist’s brilliant articles. The Economist was founded in September 1843 by James Wilson, and has stood alone with it’s pro globalization prospective. The economist was founded to take part in “a severe contest between intelligence, which presses forward, and an unworthy, timid ignorance obstructing our progress”. 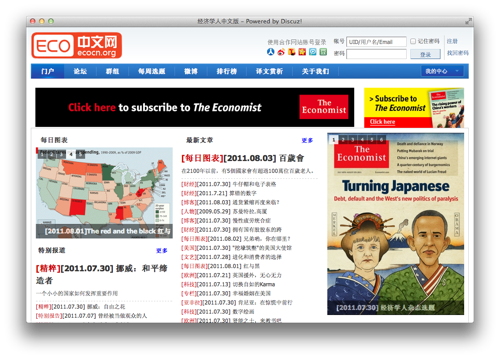 Kind of funny to watch the Chinese Black Market “economically” handling distribution for The Economist. See it for yourself: www.ecocn.org. The Federal Reserve Balance sheet is to the Federal Government what Fastow’s Loss Hiding “Raptors” were to Enron Corporation. The Federal Government has a debt of at least $14.7 Trillion. Additionally, the Federal Reserve has a debt of at least $2.5 Trillion. There is a simple way to avoid a sharp rise in the interest burden associated with a higher debt. The Federal Reserve Board can buy and hold the debt that is currently being issued by the Treasury to finance the deficit. The logic of this is straightforward. If the Fed holds the debt, then the interest on the debt is paid to the Fed. The Fed then returns the interest to the Treasury each year, meaning the net cost to the government is zero. This technique is known as monetizing the debt. Fed Gov’t Debt ($17.7T) + Fed Reserve Debt ($2.5T) = $20T. Debt is already over 140% of GDP. The important lesson here, is that the Federal Reserve Balance Sheet can continue to absorb an infinite amount of Federal Gov’t debt, for Zero fee. Enron created off balance sheet limited partnerships, these were named LJM1, LJM2 and Raptor I, I, III and IV. When Enron didn’t have enough money, it would borrow money from these off balance sheet partnerships. When it lost money, it could hide those losses in these partnerships. The Federal Government doesn’t have enough money. Nobody wants to buy Treasuries to lend it more? No need to raise interest rates – just let the Federal Reserve hold the Federal Debt on it’s balance sheet, and since profits of the Federal Reserve are paid to the Federal Government, nothing is really owed, so we can keep this cycle up indefinitely. The more junk stored on the Federal Reserve balance sheet, the less likely anyone outside of the Federal Reserve will buy treasuries – yet each time the Fed buys, it intrinsically expands the dollar supply and thereby devalues the dollar. The Chinese Central Bank is determined to store overpay for large piles of US treasuries, and the US Central Bank is also determined to overpay for large piles of US treasuries, and other Toxic assets. Future borrowing needs to move from easily devalued national currencies to a more difficult to devalue trans-national standard. I mentioned Special Drawing Rights two years ago, and they were really a pretty novel solution to the US debt problem at the time. Once the Chinese and Japanese central bankers come to their senses, if the Treasury wants to sell debt to anyone besides it’s Enron style Special Purpose Entity (the Fed), then it’s going to have to denominate debt in something more stable. Interesting SeekingAlpha article pointing out credit expansion as an often overlooked factor in developing market growth, and that when credit expansion stops, developing markets may stop developing. It is almost taken for granted that many emerging markets will continue to experience higher growth rates than more established countries including the United States, the U.K., and most of the countries in Western Europe. However, it is usually assumed to be the result of a superior educational system, a more coherent set of cultural values, high population growth, vast natural resources, and numerous other factors–all of which are almost completely irrelevant to the issue of economic vibrancy. Let’s focus on the single most important feature of emerging markets, which is the availability of credit. Developed markets have enjoyed relatively easy and plentiful access to credit in numerous forms for decades or longer–mortgages, credit cards, auto loans, installment payments, low money down payments, government-guaranteed borrowing, and numerous related institutions. In sharp contrast, much of the rest of the world was on a cash-only basis until just twenty or thirty years ago (or even less, in some ‘frontier’ countries including Colombia, Mongolia, and Uganda). If you live in an all-cash economy which suddenly begins to use credit, there will be an immediate surge in spending–and which will create a domino expansionary effect. When someone borrows money, that money quickly finds its way into the real economy. Over time, as that loan has to be repaid, this will have a gradual drag on the economy over a period of several years or more. However, the immediate impact is invariably positive. In any nation where most of the GDP growth is caused through the expansion of local businesses, as in China and India, the fact that many millions of people will suddenly have access to credit will almost certainly create double-digit increases in annual revenue for many sectors of the economy. This higher rate of growth can only continue as long as credit continues to become more readily available to an ever-increasing segment of the total population. Eventually, as in the developed world, a point of saturation begins to be approached. There are still those who do not have access to credit, but they will eventually consist primarily of those who are not creditworthy due to their limited personal circumstances, or the minority of those who simply refuse to borrow money under any circumstances. Once this saturation point is reached, further credit expansion slows dramatically. This has the immediate effect of causing lower rates of economic growth. In the longer run, the reality of widespread loans having to be repaid will have an even more negative effect on the economy, especially during times of recession when assets become less valuable, while loans are not diminished in magnitude. In relative terms, then, the loan-to-asset ratio of much of the population will dangerously increase. The author makes a good point, especially scary if you consider many emerging markets drastically (100%!) under report their public debt numbers, but credit expansion isn’t the only reason for growth in Asia. The more important, and more real story is productivity growth. China has a good educational system, stable government, and talented, hard working citizens. No reason Chinese labor should be priced at 20% of USA labor, especially when Chinese blue collar labor is MORE PRODUCTIVE than US blue collar labor in many situations (environmental regulations, employee obedience). Real-estate prices in China are already adjusted for 10-20 years from now when those prices hit parity, but still many medium/long businesses opportunities selling to the chinese consumer, particularly: Agriculture, Finance, Retail, Medicine, Health & Fitness. China is an extremely low trust environment. As Fukuyama argues, Trust is an economic lubricant, reducing the cost of transactions and enabling cooperation. Yet, in this ultra low trust environment, companies still have to offer financing terms to their business partners. The result, is that collecting the outstanding cash is very difficult, many payments are unable to be collected, and companies are often uncertain of their overall financial position. From Dec 1st until Chinese New Year, many Chinese companies are focused on collecting outstanding accounts. Books are typically closed on (Lunar) Chinese New Year. 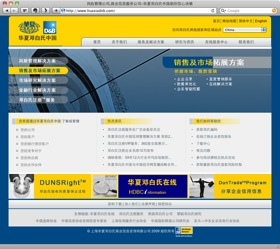 They don’t have much penetration yet, but Dun & Bradstreet (DNB) has partnered with Huaxia Bank to expand into China. 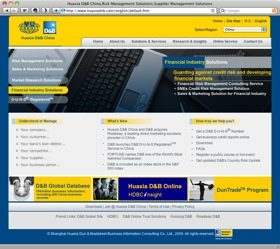 (Huaxia is 20% owned by Deutsche Bank﻿). Every Chinese company having a D&B number would be a big step forward for businesses, and with Web 2.0 technologies, D&B should be able to leverage the Chinese business community to get an early read on which companies are growing, which are struggling, and who you can trust to pay on time – if ever. Note the D&B/Huaxia JV started in Dec 2006, more than a year after Deutsche Bank acquired a 20% stake in Huaxia, yet it doesn’t seem to be getting a lot of traction yet. Probably not ideal to structure this sort of thing as a JV – since it’s not in the business of actually granting credit, just acting as an information service, and since D&B is a strong global brand that can quickly earn trust in China, it’s probably better structured as just a Foreign Enterprise, ideally selling stakes in that enterprise to each of the biggest Chinese banks. That way you’ve got government support, access to proprietary government information, but you have the free market incentives necessary to succeed anywhere. It’s already been nearly 4 years, and the JV may need to be restructured, but D&B has the potential to have a huge impact on China – an impact on society far beyond what consumer goods companies can hope for. It’s difficult to find a running partner with your same schedule and your same ability. It’s a lot of work to track your progress, and there’s not much sense of accomplishment. 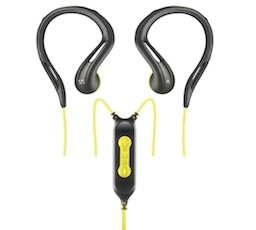 First, the Sennheiser PMX 680i earphones hook over your ear, making them the first earphones to not fall out of my ears when running vigorously, the earphones also have an onboard control (volume, pause) and a microphone – just like the standard iPhone 4 headset. Next, there is an iPhone App called “Jog Log” that supports multi-tasking the way you would expect, including some smart iTunes controls that also work exactly the way you would expect. There are lots of iPhone running Apps, but Jog Log actually lets you listen to your music, and even to pause and skip, but doesn’t get in the way. Jog Log also gives your a “Ghost Partner” that you can use to train against. First, go into Settings / Audio Cues and turn ALL of the Audio Cues on. This way you get updates on your Average Pace, Current Pace, Target Pace and Heart Rate – typically every minute. You can adjust the Cue frequency if you like. Then, go into Settings / Target Pace, and set the pace of your Ghost Runner Nemesis. As you’re running, you’ll get an updated every minute telling you how far you are ahead of (or behind) the Ghost Runner. When using Jog Log, you get all the information you could want while you’re running, and you never need to actually look down at your iPhone until you get home and want to inspect the map of the run you just completed. Last, there’s the DailyMile, which Jog Log integrates with, and will automatically pump your daily run results into. DailyMile keeps stats on how much you’ve run this week, this month, year-to-date, and lifetime – including maps of your runs, commentary and even blog posts if you like. DailyMile is a whole online community focused entirely around running. Jog Log also has Heart Rate monitor integration, and lots of innovative Heart Rate related features in store. If you’ve got your own Heart Rate monitoring ideas, join in the discussion. If you’re using this monitoring solution in Shanghai, be sure to fix your iPhone GPS first. UPDATE PPS releases official Mac version. PPS recently released the first official Mac OS X version of PPStream. Mac OS X “.pkg” or “.dmg” installer packages are available. It’s probably easiest to just grab the installer here pps.dmg. Or you can directly visit the new PPS for Mac download page to view all available options. Note that PPS is also available for iPad, iPhone, Android and Linux!!! Way to go PPS team. For reference, I’ve included the origional PPS vmware instructions below, but they are now obsolete. Our last Mac OS X problem is the “U盾” for online banking “网上银行”. Even QQ works quite well on Mac OS X these days. PPS (Peer-to-Peer Stream) a popular P2PTV service works like a Real Time version of BitTorrent, merging the Internet peers provided content into a local steam that’s read locally by Windows Media Player, Real Player, or another similar plugin. PPS is only available for Windows. Fortunately, modern Mac computers are based on x86 architecture (same as a PC chip) and modern x86 CPUs have extensions optimizing them for Virtualization – allowing a Virtual OS inside your regular computer to run at nearly the same speed as any other applications. Both x86 Intel (Intel VT-x) and AMD (AMD-V) chips support such Virtualization, though all Mac’s use Intel chips due to Intel’s strength in low power, mobile computing such as the Intel-M.
Wine would be the most ideal way to run PPStream, as it emulates Windows without actually requiring your virtual machine to have Windows installed, but unfortunately PPStream isn’t compatible with either the OpenSource Wine or with CodeWeavers “CrossOver” commercial version of Wine. VirtualBox is also free, and under some circumstances will allow you to run PPS, but there are some bugs when resizing the “Windows XP” screen on your Mac Desktop. If you ONLY run PPS full screen (and never run it as a background window), the VirtualBox is another fast, free way to run PPS on Mac OS X.
Parallels was the first virtualization package available for Mac OS X, but I’ve found VMware to be more stable and less frustrating over the long term, so I highly recommend VMware. There VMware vs Parallels wikipedia page seems to be run by the Parallels marketing department, but LowEndMac has an extensive VMWare vs Parallels article. VMWare Fusion works perfectly running PPStream, regardless of Single Window Mode, Full Screen Mode, Unity Mode, regardless if you are constantly resizing, or if you just use one screen size. The Ryder Cup, a competition between the USA and Europe, is held ever other Autumn. Note that prior to 2001 it was held on odd years, 2001 was skipped, so now it’s held on even years. 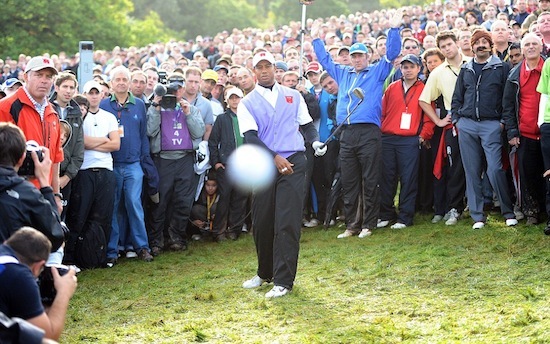 At last weekends Ryder Cup, at the Celtic Manor in Wales, Tiger Woods hit his ball straight at Mail on Sunday photographer Mark Pain’s camera lens, enabling Pain to capture this amazing shot on his Nikon D3S camera, with a 24-70 mm lens and a shutter speed of 1/1000 of a second﻿. See the original MailOnline article. Perhaps more interesting is the “Cigar Guy” in the upper right corner of the picture. The legend of Cigar Guy was born. You can see a bunch more information about Cigar Guy here.